Everyone eats McDonald's. Some people say they don’t, or they go for long periods of time without it, but they always come back around out of necessity or nostalgia or the need to dip things in Sweet & Sour sauce. 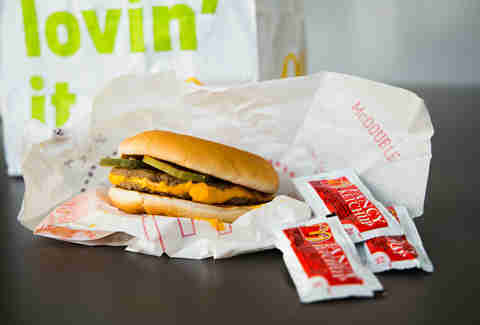 The issue for most people who are not McDonald's connoisseurs is that they don’t try new things. I’m certainly guilty of that -- I don’t go enough to feel like I want to try a new sandwich when I’m there. I just want one of the three orders I’ve been getting since I was 4, plus a Christmas Muppet Happy Meal toy. So, in an effort to allow other casual McDonald’s users a cheat sheet to the myriad sandwiches McDonald’s offers that they’re potentially missing out on, I decided to try every single McDonald’s sandwich available (McWraps didn’t count), and rank them according to taste. Because there are 22, I did not eat them all at once. I am not a masochist. I tried to get four or five sandwiches at a time and enact the three-bite rule, or, in the case of seasonal offerings like the McRib, tried to remember what they taste like. But anyway, enough about my weight gain, here they are, from 22 to 1. What I say: The worst, most guilt-stricken part about this? 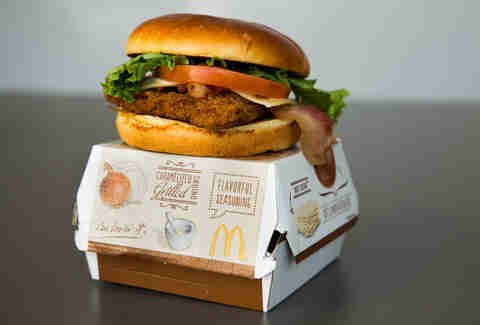 I am a confirmed Catholic, and I still don’t have any place for this fried fish sandwich, even on Fridays. Sorry Lord, it’s not you. What I say: I’m not sure what to make of this. One part of it reminds me of when you put chips on your sandwich, which is delicious. But the other part just seems like the burger version of a BBQ chicken salad at CPK, but without the crucial cold crunch of that jicama. WHERE IS THE JICAMA? What I say: You’re going to sense a theme here, so I might as well get it out of the way. I love bacon. 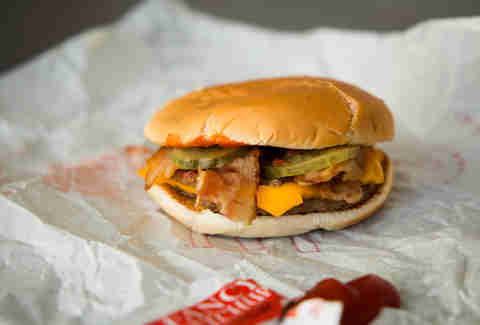 I love it just as much as the next person who eats a moderately alarming amount of bacon. But I don’t love the bacon at McDonald’s. I think it distracts rather than adds value. Also, while I’m just revealing everything, if you saw my chicken sandwich taste-test, you’ll know I don’t like cheese on fried chicken. It doesn’t need it. 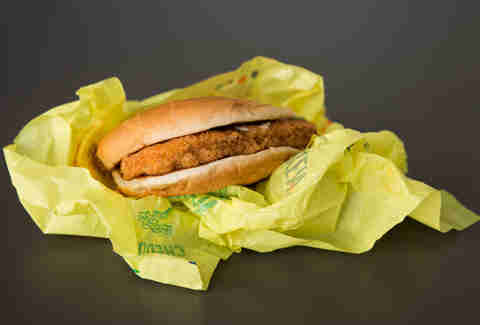 So really, this McChicken had no chance. 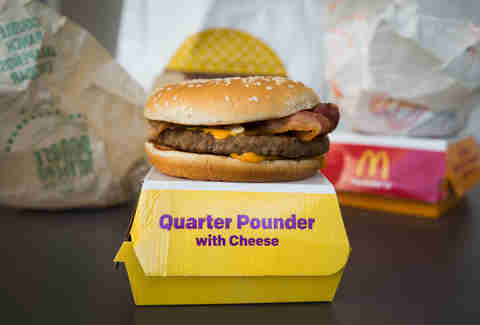 What I say: This has nothing to do with the Quarter Pounder itself, or even really the bacon. It’s the “bakery-style bun.” It’s too dry and doesn’t blend well with the meat and toppings. McDonald's buns usually do a great job of staying out of the way, but this did not. What I say: Still with that damn bun. Oh, and yeah, I’m also anti-tomato. What I say: I prefer thinner, griddled-style patties on my burgers, so the Quarter Pounder is always a little much for me. Now double that up, and it’s just too damn aggressive. What I say: This artisan roll is MUCH better than the bakery-style one. So points there. And you’d think that I would rate something with bacon, tomato, and not-fried chicken much worse than this, but I’m telling you, the grilled onions, and the addition of Big Mac special sauce made my entire day. You could probably put that special sauce as frosting on Mini-Wheats, and I would eat them. So... what say you, Kellogg's? COLLAB? What I say: This reminds me of summer and getting barbecue sauce on the steering wheel of my old car from college, and not caring because I was so young and full of life and ignorant of tax laws. So who cares if it’s actually a pork patty? DON’T RUIN THIS FOR ME. What I say: My Dad always gets two hamburgers and nothing else when he goes to McDonald's, which is probably twice a year. And when I was young, and they still pre-made many of the burgers, I’d get annoyed because they’d never have hamburgers already made, because who really ever orders hamburgers? But he did, and they’re delicious, despite lacking that crucial dairy element. What they say: Two 100% beef patties simply seasoned with a pinch of salt and pepper, a slice of melty American cheese and topped with tangy pickles, minced onions, ketchup and mustard. What I say: The only difference I can ascertain between this and the double cheeseburger is that there's only one piece of cheese. And now you know why it's ranked behind the double cheeseburger. What they say: Two 100% beefy patties simply seasoned with a pinch of salt and pepper, two slices of melty American cheese, tangy pickles, minced onions, ketchup and mustard. What I say: Cheeeesseeee (spoken aloud in the voice Vince Vaughn does in Old School). What they say: A quarter pound of 100% pure beef simply seasoned with a pinch of salt and pepper, two slices of melty cheese, slivered onions and tangy pickles all on a sesame seed bun. What I say: It was never my go-to and never in my steady rotation, but I can still appreciate the classic order of high school football linemen everywhere. What they say: A crispy McChicken patty topped with Buffalo sauce, creamy buttermilk ranch and shredded iceberg lettuce, served on a toasty bun. What I say: Yeah, this works pretty damn well: no wasted toppings, great flavor combo, no bacon. If McDonald’s starts working their way into the Buffalo Wild Wings bar game, they could lead off with these. What they say: Famously crispy chicken topped with mayonnaise, shredded iceberg lettuce and served perfectly on a toasty bun. Show your taste buds some lovin’ with this local option. What I say: Why are McChickens so damn good? Well, for one, they don’t mess around with the tomato and cheese game, and, for two, it must be something about that combination of hot fried chicken, iceberg lettuce, and mayo all coming together. Or the name. Great name. What they say: Juicy, crispy chicken breast filet with a hint of dill and tangy pickles all served on a buttery steamed bun. Southern hospitality at its finest. What I say: When these first came out, I thought it was a horrible idea. Are you really going to try and compete on Chick-fil-A’s turf? And then I tried one, and -- while it’s not Chick-fil-A, okay? DON’T FREAK OUT -- that hint of dill in the fried chicken batter and the soft steamed bun and pickles make for a very good replacement player. Especially on Sundays. 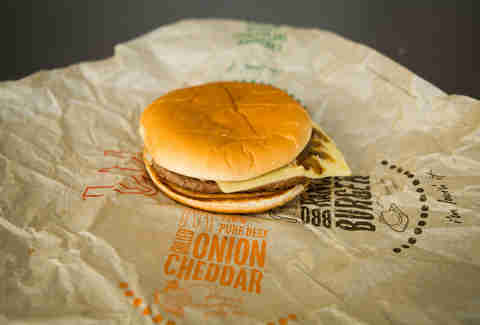 What they say: A juicy 100% beef patty topped with grilled caramelized onions and smooth melty cheddar. What I say: This is the exact style of burger I like, if you replaced the cheddar with American and served it out of an old-time burger shack in West Springfield, MA. And -- much like the Southern Chicken -- I was very dubious the first time I tried it, but it really works. The caramelized onions could have used a little more pepper, but, man, I could probably eat six of these things while sitting on the couch watching The Pelican Brief on laser disc. What they say: A juicy 100% beef patty simply seasoned with a pinch of salt and pepper, melty American cheese, tangy pickles, minced onions, ketchup and mustard. What I say: My order at McDonald's, starting in high school, always consisted of two cheeseburgers, and then whatever I was going to actually get to eat as my meal. The cheeseburger is such a vital part of the experience, and, one of the key elements, aside from a lack of bacon and tomato, is the minced onion, which gives a little bite and spice along with the pickles and other condiments. It’s enough to make me actually learn how to mince. 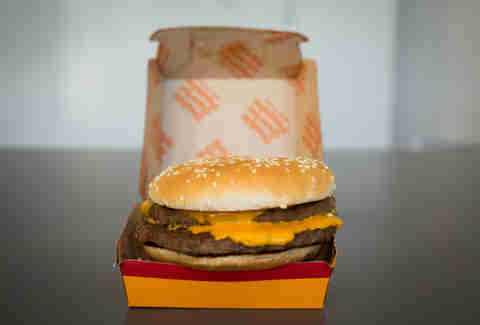 What they say: A double layer of sear-sizzled 100% pure beef mingled with special sauce on a sesame seed bun and topped with melty American cheese, crisp lettuce, minced onions and tangy pickles. What I say: Here’s a serious question, brought up to me during this tasting by our senior editor Matt Lynch. 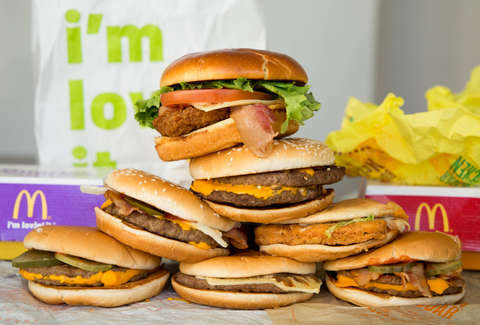 Why is there no such thing as the Little Mac, which would include the same toppings as the Big Mac, but just get rid of the middle bread and second patty, and pay tribute to the tiny boxer who is extremely good at punching King Hippo in his belly button? I would buy that burger at least 30 times a year, and rally my family to serve them on Thanksgiving. But anyway, after a long tasting, I was relieved to see that I still love this thing as much as I do. My favorite fun fact about it is that its original name, the Aristocrat, failed as hard as you might expect, but the actual build of the burger -- burned into my skull by commercials from the '80s -- is a thing of beauty. And now they even sell the damn sauce. Win-win. Kevin Alexander is the Food/Drink executive editor, and once ate a 20-piece McNuggets BEFORE actually deciding what he wanted. Join his special-sauce fan club mailing list: @KAlexander03.